Bears attribute the stock market’s recent correction to fears of rising inflation. This isn’t true. The rally before this correction was the longest rally in history without a 6%+ “small correction”. Hence, a correction was overdue. Rising inflation was merely an excuse for the market’s selloff. I demonstrated in a previous post that inflation will not stop the equities bull market until it hits at least 4%. U.S. inflation is hovering slightly above 2% right now. Inflation still has a lot of room to run before it impedes stocks. Some bearish investors expect inflation to surge and hurt stocks immediately. I disagree. I think inflation will slowly grind higher in 2018, increase faster in 2019, and possibly surge in 2020. There are no signs that inflation will surge in 2018 yet. The year-over-year change in commodities leads inflation, which is the year-over-year change in CPI. This is because it takes time for companies to adjust their prices AFTER raw material prices have changed. Commodity prices have barely gone up from 2017-present. Commodities like gold, silver, agriculture, etc are forming a broad base. Aside from oil, commodities aren’t breaking out yet. Hence, inflationary pressure from commodities is still weak. I expect this to be a major contributor to rising inflation in 2019 and 2020 as commodity prices enter into a major bull market. Here’s the CRB Commodities Index. Notice how it is forming a U-shaped long term bottom. History shows that the first leg of commodity bull markets are slow. They do not induce soaring inflation until commodity prices start to go parabolic. Bears are concerned that Trump’s tax cut and a rising federal debt will cause inflation to soar. History suggests otherwise. … while interest rates have been going down. Inflation tends to rise slowly at first and then pick up steam in later years. The U.S. economy recently cleared the deflationary risks of 2015-2016. No economy jumps straight from deflation to high inflation in such a short period of time. Inflation surged in the 1970s due to political reasons (OPEC oil embargos). Those conditions do not exist today, thanks to U.S. shale and the destruction of OPEC’s oil price power. Remember how bears were screaming about the inflationary risks of QE less than a decade ago? 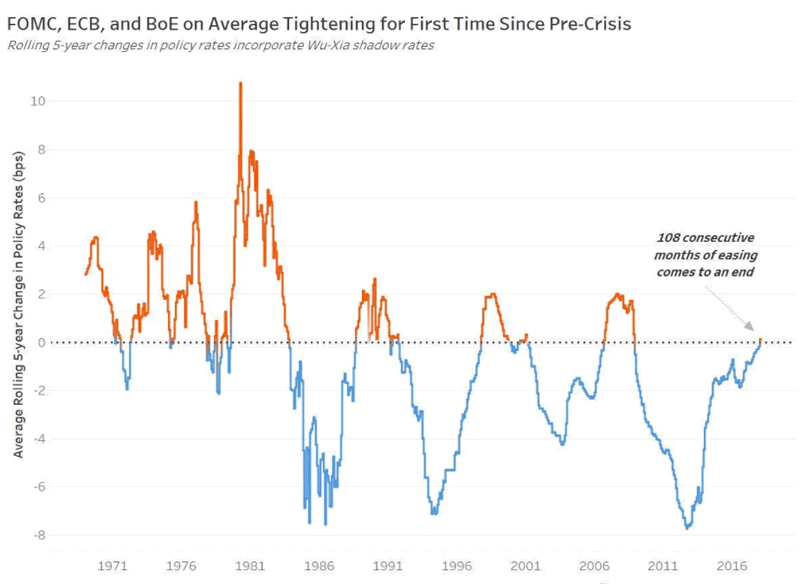 Well central banks around the world are now tightening monetary policy for the first time in a decade. Monetary tightening will slow down the rise of inflation.